is "Designeer" and Connection Maker for Strategic Design. With the advent of ICT (Information and Communications Technology), urban components are becoming increasingly embedded with media devices and networked through the Internet. 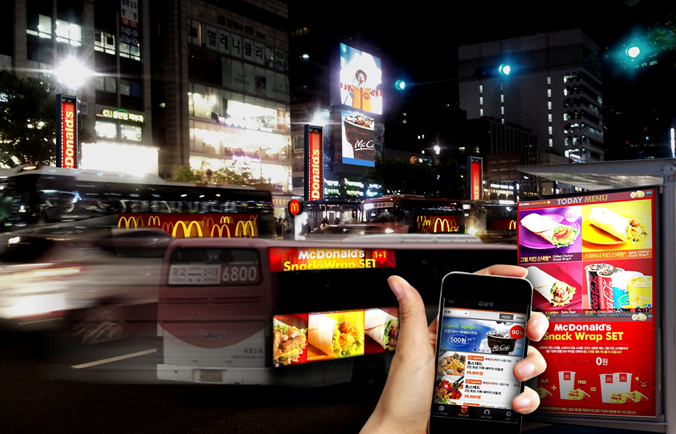 Urban media such as urban screens, bus shelters, and media facades are in turn affected by this development. Urban space becomes the site where new interactions are generated, going beyond traditional notions of interaction, and urban media are progressively shifting from a mechanical paradigm of “interactivity” toward a biological one, as in the cybernetician’s vision. Thus, this research aims to propose a new method for approaching and designing mobile urban media that support biological phenomena based on an emergent approach. The mobile urban media platform proposed is a multi-agent system that broadly consists of hardware and software. The hardware is composed of GPS-based mobile urban media with several modules, including outdoor display screens such as on bus exteriors and taxi tops. The software takes the form of an location-based application in order to control diverse types of contents in the urban context. When mobile urban media enter a media zone which is allowed to construct the hierarchy between the mobile urban media through simple local interaction, various elements of suitable content in specific urban contexts are produced by the interactions between mobile urban media. Copyright © 2012-2018 by MINWOO KIM. All rights reserved.